Five years ago, I found an unexpected gem waiting in my review list: the debut album “Misanthropy” by Italian Blackened Death Metallers HISS FROM THE MOAT. This album was soon to become one of my favourites, having been listened to many, many times in the years since then. What makes this music so great is that it draws from the best of multiple genres, giving rise to an unstoppable leviathan of a sound. Driven by the technicality and speed found in Death Metal, yet also tempered by the malignant and soul-chilling darkness found in the most malevolent Black Metal, whilst still managing to hold all together with a sense of unbreakable grandeur, HISS FROM THE MOAT has it all. Since then, I have been eagerly anticipating their next album, undoubtedly like many fans have been. And finally is the moment we have been keenly waiting for: “The Harrier” is here! The intro “The Badial Despondency” sets the atmosphere, melding the screams of children with religious austerity, culminating in a soundtrack of a nightmare. The sudden ending of this leaves you in a state of uneasy tension, which gets completely shattered when the title song “The Harrier” comes bursting in a frenzy of blast-beats and machine-gun fire guitar tremolos. From the first few notes of this song, it’s already clear that the long wait for this album was worth it. “I Will Rise” picks up the tempo whilst also cranking up the malevolence and the technicality. In contrast to this, the salvo that is “The Passage to Hell” uses clever changes in tempo and less brutal sections to add new facets to the album, similar to what “Caduceus” did in the debut. “Slaves to War” in turn is more melancholic and despairing, with a much heavier emphasis on melody than the songs before it, fast becoming one of my favourite songs on the album. Cold Black Metal riffs add to the frigid atmosphere of this ponderous yet pounding song. However, “Sine Animvs” soon sees a return to the more brutal style, with some fantastic drum-work adding ferocious dimensions to the song. “The Abandoment” on the other hand is a beautiful acoustic guitar interlude, showing off the very best of their musicianship in a flurry of cascading notes. This slower and almost pensive mood gets carried over to “The Allegory of Upheaval”, albeit with a harsher and darker feel. Conversely, the faster and more relentless sound returns in the crushing “God Nephasto”, a song with seemingly enough blast-beats to launch a small rocket into near-orbit. In the penultimate spot we have “Unperishing”, which sees the influences return more towards the Death Metal spectrum, carrying on in the unrelenting vein, and likely being a killer song in a live setting. And after this complete battering we have received so far, the piece de resistance is “The Decay of Lies”, a more languid yet menacing song which seems to drag you through a quagmire of despondency tempered by ravenous and ravaging guitar-work. As with “Misanthropy”, speed and brutality are the golden standards adhered to throughout. However, “The Harrier” goes far beyond being a rehash of its predecessor; HISS FROM THE MOAT have taken their sound and redefined it, letting it fester and ferment into a ferocious yet dark sound that is devastating. 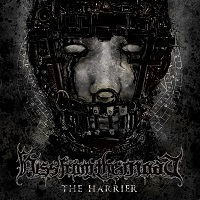 Whilst I found “Misanthropy” to be almost a hybrid of BEHEMOTH and VADER, “The Harrier” sees HISS FROM THE MOAT embrace their own sound, returning with an even more powerful and shattering offering. HISS FROM THE MOAT unfortunately remain one of the most criminally underrated bands in the underground scene, which is a huge pity, as they have all the makings for a truly phenomenal band. If you haven’t heard of them before, all I can do is highly recommend giving “The Harrier” a listen. And if you already know HISS FROM THE MOAT, then you probably have this album on repeat by now, just as I do.